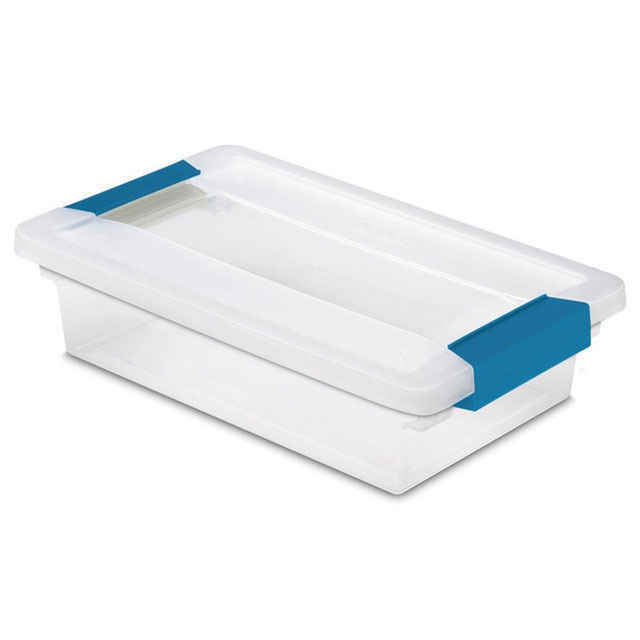 This Sterilite small clip box (Sterilite 1961) can be used to organize items in all areas of the home. These boxes can be used in the office to hold index cards, note pads, paper clips, and many other supplies. You can also organize your medicine cabinet with the help of a Sterilite small clip box. Scrapbooking supplies, beads, crayons and other craft supplies can be found quickly with a Sterilite small clip box. In the kitchen, these Sterilite small clip boxes can hold measuring cups and other cooking utensils. The transparent lid has clips that keep all of the contents secure. The storage box itself is also transparent, making it easy to find exactly what you're looking for. These containers can also be stacked on top of one another, saving space on shelves and in drawers. The whole family can use small clip boxes. Comes in a set of 6 Sterilite small clip boxes.